Create your own watch in different styling! It is really an integration of Beauty, Charming, Luxury and Creativity. Contents: 1 Watch, 7 Watch Cases, 7 Pattern Straps, 7 Bezels, Beads, Color Laces, Cords, Accessories, Manual…. This toy costs approximately £12.99 (for the latest and best prices make sure you check our retailer list for the Ultimate Watch Gallery above). 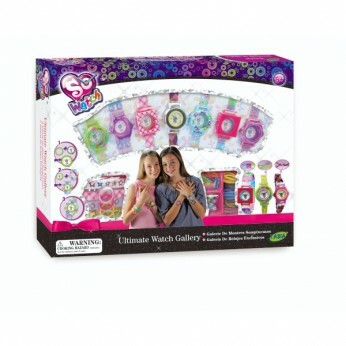 In our review of Ultimate Watch Gallery we classed it as being suitable for ages 6 years, 7 years, 8 years but recommend you check the manufacturer specific advice before purchasing.